So today’s post will be different than normal. I’ve been partnering with One Green Planet for a while, sharing my recipes with them, and they just put out a new plant-based recipe app called Food Monster! Today I’m just going to share some of the app’s features with you. I hope it’s helpful in your decision whether the app would be a good fit for you or not. If you decide you want the app, you can download it HERE! 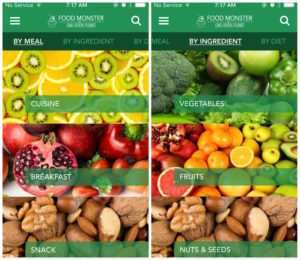 Imagine being able to browse through 5,000 + plant-based recipes in one place on your phone. Well, now you can! 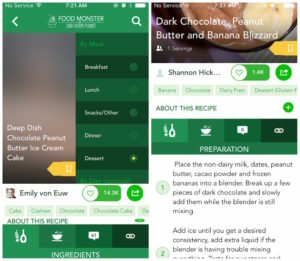 One Green Planet, “your online guide to making conscious choices that help people, animals and the planet”, just released their recipe app called Food Monster, which contains over 5,000 delicious, plant-based recipes!! I think my absolute favorite part of the app are all the different categories. If you want to just look for recipes for a quick dinner you can. If you’re craving a single-serve dessert, you can search for that too. If you’re laking inspiration for spring recipes, you can search through the seasonal spring tab. It’s awesome! 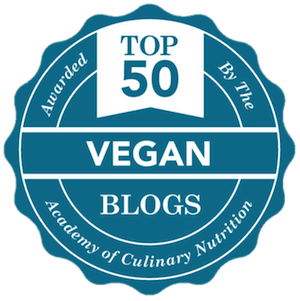 Some other categories that you can search through are raw soups, spiralized veggies, quick meals, nutrient dense recipes, budget-friendly recipes, less than 5 ingredient recipes, breakfasts, snacks, vegetables, nuts and seeds, gluten-free recipes, grain-free recipes, no/low sugar recipes, and on and on! 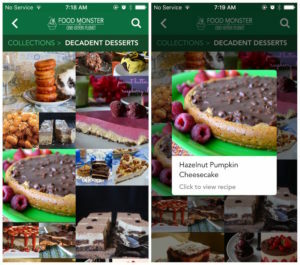 If you’re someone that is looking for an easy to use recipe archive that gives you thousands of recipes to browse through in one place, the Food Monster app is definitely for you! Below I’ll show you some screen shots from the app along with some descriptions so you can get a better idea of what you’ll receive when you purchase the app. At the end I’ll also share my thoughts on what I consider some consider some cons to the app. On the home page you’ll find your name, subscription date, and a list of different tabs that you can choose from to begin searching through recipes. You can search through seasonal recipes, explore new ingredients or diets, peruse through different collections of comfort foods, creative salads, cheesy meals, and more! You can also see the recipes you’ve bookmarked or search through trending recipes that other people are finding exciting and fresh, such as my Homemade Vegan Twix Bars (also known as Chocolate Caramel Shortbread Bars)! I love how the app allows you to search by specific meals as well. If you don’t have anything planned for breakfast, you can search through hundreds of breakfast recipes for inspiration. If you want to try out a new cuisine, just click on the “cuisine” tabs. If you’re trying to incorporate more vegetables into your diet, you can explore recipe centered around vegetables. 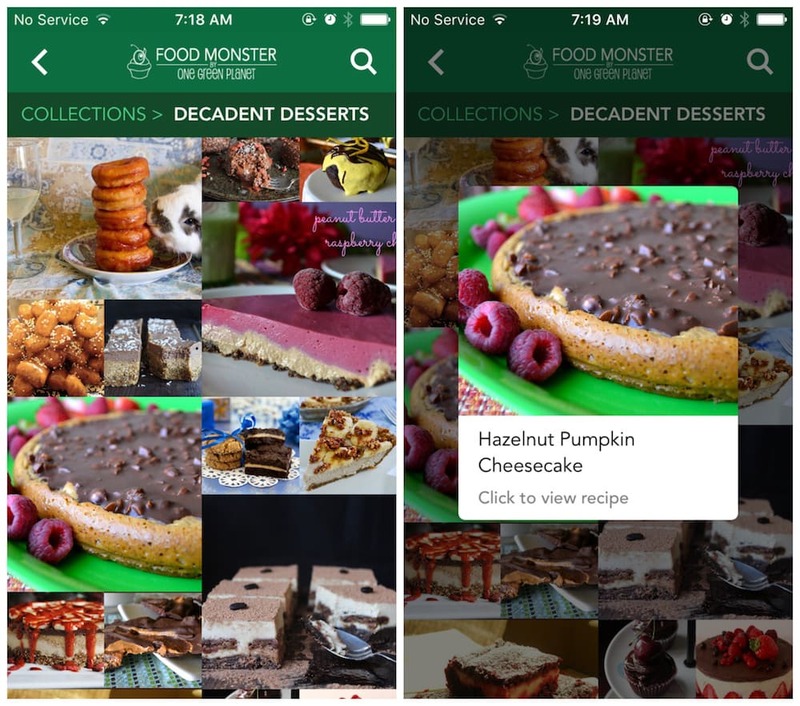 If you click on the “collections” tab you’ll be able to search through different, visually appealing collages that feature comfort foods, creative snacks, hidden ingredient recipes, hot and spicy recipe, and, as seen below, decadent desserts. When you see a photo that looks appealing, just click on the photo and you’ll be able to get the recipe! 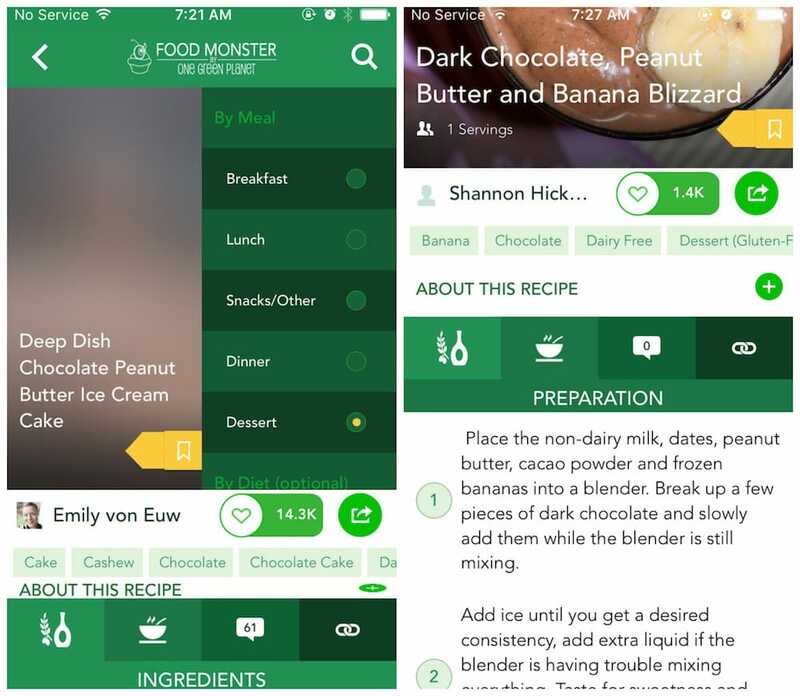 The recipes shown in the app are very easy to follow. First of all, you can save recipes that you want to try later in your bookmarks tab. 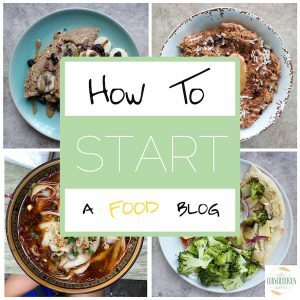 If you want to see the ingredients, preparation steps, comments or other similar recipes, you just click on one of the four tabs below “about this recipe.” It’s as simple as that! If you love browsing through recipes, drooling over food photography, or inspiring yourself to get creative in the kitchen, I really encourage you to check out this app! The two factors that I felt were cons to the app were the price and the fact that some of the featured photos flicker to show you multiple shots of the same recipe. But while I do think it’s a little pricy, for a year access to new plant-based recipe right on your phone, and 12 NEW RECIPES A DAY to look at, I think it’s worth it! To download the app, go HERE! It really is cool…but pricey:/ I should have written that closer to the top, but I do love that they add 12 new recipes everyday!